I am not going to talk about how much we South Indians love our “tumbler” of coffee. This concept has already been overdone on a million other Indian food blogs because every South Indian blogger is wildly proud of the filter coffee we grew up drinking or watching people drink. Making it is yet another story. If you need more information, Wiki, as always, has answers. In another land where people are fiercely protective about their cuppa, it is always an adventure to go shopping for coffee powder and deciding whether decaf or extra dark is the right way to go. My taste in coffee hovers between the two extremes. While I prefer good ‘ol Folger’s for everyday consumption in the American South, I am a sucker for the traditional mug of piping hot filter coffee back home. So when Amma came here, she brought with her a huge bag filled with Coffee Day coffee powder packages that is probably going to last us a few months. Result: I have temporarily migrated back to my strong filter coffee with a dash of milk and Splenda. Life is perfect again! 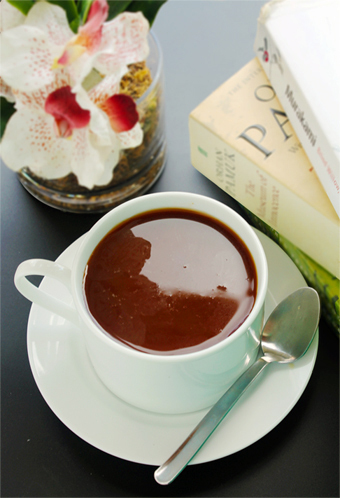 So what is it that distinguishes the South Indian coffee from the All-American coffee? Surprisingly, nothing much! The former is a denser and finer sibling of the latter, hence, it feels like it has more flavor. Moreover, the mouth feel varies between the two primarily because of the difference in the coffee powder-water ratio. South Indians make their base, what we call decoction, thicker and “tar-like” which means a quarter cup of the concentrate and three-quarters a cup of milk makes perfectly strong coffee (boiling the milk also helps the consistency and gives it a special, sweeter taste). Since the American coffee base contains more water, we end up with a watery (yet tasty) cuppa to which we add just a tiny spot of creamer. This works for me because in America, I love my coffee regular, black and with a hint of sugar. Of course, the apparatus we use to brew coffee should also be mentioned here, for these contraptions literally decide what kind of coffee you are going to have that day. South Indians may talk all they want but the traditional coffee filter they use actually yields slightly diluted decoction; but thankfully most people in charge of making this brew are finished with this often troublesome contraption and have moved on to the more modern (and more effective) electric coffee maker… which is what I bought on my 2011 trip to India. This trusty little piece of equipment has never let me down and I love her dearly. Now, you may try making Indian-style coffee with Starbucks’ dark roast in an American coffee maker with lesser amount of water. But it will not be the same and may clog up your coffee maker. Tasty it will turn out, for sure. But really, Indian coffee is redundant without the Indian coffee filter as is American coffee without the American coffee powder! Categories: amma, Chennai, Childhood, coffee, Drink, Food, Indian, Musings, South | Tags: american, beverage, coffee, cuppa joe, drink, java, joe, milk, south indian, splenda, sugar | Permalink.